There aren’t enough words to describe my complete fascination with this subject. In my study, I have seen many opinions which seem to focus more on political situations and decisions rather than on the possible physiological and educational aspects. The fact that it is brain-based, and that there are proven strategies to combat this makes me a more effective educator. If we can look past the stereotypes and myths into the scientific research and practical methods to combat the negative affects on the brain caused by living in poverty, we can raise up a whole new demographic of children to be effective learners in the classroom. Poverty has a strong effect on the physical and emotional well-being of children. 40% of children who come from impoverished neighborhoods are shown to have deficiencies in at least two areas of functioning by the time they are three years old (Born, 2011). Student who come from impoverished circumstances face large obstacles when it comes to their education. They are not secure physiologically and therefore struggle to have an acceptable level of academic achievement. Dr. Eric Jensen did/does extensive research to help educators understand brain-based learning from the perspective of students who come from impoverished homes, versus those who come from more middle class homes. I was most impacted by his study of “Attunement”, or the process by which the primary caregiver helps to develop proper emotional responses in a child (Jensen, n.d.). The fact that we are only born with about six hardwired emotional responses, and the rest are learned/imitated from our primary caregiver was new to me (n.d.). Also the hardwiring of emotions takes place until about the age five, was information I had never before discovered (n.d.). It is amazing to see the effect poverty has on student learning. I have been told many times throughout my academic career that it was far more difficult to teach in low-income settings due to a lack of resources; however the science behind the difficulties was never explained. I finally understand some of the reason my students act a certain way. Students from lower income families tend to laugh off reprimands, so that they can save face (Payne, 2003). This information was valuable to me, because now when students laugh or smile at inappropriate times, I will have a better understanding of why that is. I will then be able to work with them to develop a better response. Understanding the way that the brain works when it comes to educating students is important to help educators understand some of the things they can do to help their students to be successful. Payne, R. (2003). Framework for understanding poverty. (3rd ed.). Aha Process Inc.
As a teacher, many segments of Dr. Jensen’s video resonate with me, particularly his ability to share his own personal childhood experiences along with his explanations. First, with regards to mirror neurons and imitation learning, students will “mirror” behaviors of other children and negative interactions, just as they will positive ones. This is significant if a child is exposed to many consistent negative experiences. Also, chronic stress or distress can greatly impact children’s lives. High-poverty children have many symptoms including diminished social judgment skills, lack of concentration, and reduced neurogenesis. So, if I have a student in my class who doesn’t want to participate and acts helpless or a student who is hyperactive, this doesn’t necessarily mean that these students don’t want to learn. Their actions may be symptoms of the high-stress environment in which they are living and the uncertainty in his/her life. As a teacher, it could be easy to become frustrated with these responses to academics, but understanding the student is essential to know how to reach him/her. Finally, he discusses how positive relationships between students of poverty and other adults can make a world of difference. If a teacher builds a trusted relationship with student and has high-expectations of success, the student is more likely to succeed. This is closely related to Dr. Ruby Payne’s research regarding making “emotional deposits”, but avoiding the “emotional withdrawals”. For example, a teacher should be respectful and keep promises, rather than use sarcasm and show disloyalty. According to Payne, establishing these emotional relationships with teachers will foster academic achievement. First, I wanted to state how much I enjoyed watching this video. I found the information Dr. Jensen covered fascinating. After watching the video, I feel like I have a better understanding of my students in my virtual classroom. I have witnessed several students who Dr. Jensen described as himself when he was a student in high school. These kids have “shut down,” and at times I would find myself frustrated wondering how I could reach these kids. Dr. Jensen provided excellent suggestions on how to reach these children. First, it is important to establish a sense of community in the classroom. If these students don’t have a stable home life or someone in their family to trust, they need this comfort at school. In addition, it is also important for educators to be truthful and honest with their students. If an educator does make a mistake, the teacher should apologize and fix that mistake. This builds a trusting relationship between a teacher and student. Lastly, Dr. Jensen stated that students need to be taught properly how to behave. If these students didn’t experience attunement at home, we cannot expect them to understand how to behave properly in school. Instead of thinking of these children as a “problem,” we need to address the real issue. These “problem” children need to be taken by the hand and shown how to behave and handle stress if we can ever expect them to succeed in a school system. Eric Jensen maintains that teachers significantly underestimate students’ learning potential. He states that today’s test-driven educational practices may be miscalculating young minds. Jensen refers to IQ studies, as well as neuroscience research, and explains why the idea of the “fixed brain” is a myth and how certain types of learning conditions can actually enrich the brain. One of the things teachers must have in their classrooms are stimulating learning environments and physical exercise. Students must also receive balanced nutrition. In addition, Jensen states that attention to the pre-school years is essential. Jensen researched special needs and gifted children, and how poverty can place young brains at risk. He states that too often, educators haven’t been prepared to fully understand the challenges students in poverty face and how to help their students overcome those challenges. Urging teachers to move beyond basic, straightforward approaches to schooling, he advocates for an enrichment-based educational system that would customize schooling to every learner. This system should include steps that parents and educators can take to enrich learning in the home, the school, and the classroom. Born, C. (2011). Understanding poverty. [PowerPoint slides]. Franciscan University of Steubenville, Steubenville, Ohio. After watching Dr. Jensen’s video, I learned that students are subject to their living environments. Also, the suggestions he makes for educators can make a difference in the classroom. Teachers should create a new environment and have high expectations for their students in the classroom, and teach proper academic behavior. Teachers and administrators need to be adaptable, committed, and culturally aware of their students. In America, the family structure is changing, which is shaping education and economic outcomes for students. The fact is we are all unique and different in our beliefs, cultures, and family structures. Poverty in American schools is a challenge along with the opportunity to allow for a positive learning environment and student achievement. According to Dr. Jensen, teachers must create a sense of community in the classroom, and taught how to build trusting relationships. This country’s make-up is beautifully landscaped by our different ethnicities, cultures, and language diversities. Unfortunately when diverse groups interact, some individuals allow for tension, stereotypes, and discrimination. American schools must find ways to respect the diversity and economic status among their students, and create an equal opportunity for all students. Teachers and administrators must be dedicated, willing to adapt, and patient with the learning process towards student achievement. The goal in education is teaching our students the importance of learning and respecting one another. In addition, practicing and preaching the necessity of incorporating these issues is crucial to creating a comfortable, safe, and positive learning environment for every individual student. What I have learned about brain based learning from children with poverty is that the teacher can make a difference in their lives even when social conditions are poor. (Jensen,2011) The first effective tip given by Jensen is to increase physical exercise or activity. The optimal type of physical activity is gross motor activity like power walks, running, swimming and aerobics. I thought that it was interesting that it had to be voluntary exercise instead of forced which is so common in gym or physical activity classes due to the level of cortisol that is released. Good chemicals such as noradrenaline, dopamine, and cortisol that are released from this activity cause an enhancement for focus, learning, and memory. Mentoring, teams, and the buddy system help to strengthen a social grouping which also enhances learning and retention. After investigating poverty and children, I have walked away with the realization that poverty impacts children significantly. The fact that forty percent of children living in chronic poverty had deficiencies in at least two areas of functioning at age three was alarming to me. (Born, 2011) Both lectures pointed out that blaming teachers for student failures is misguided. Great teaching cannot cure poverty, however great relationships with students by their teachers can improve achievement and improve their self concept. Miller, P. J., Cho, G. E., & Bracey, J. R. (2005). Working-class children’s experience through the prism of personal storytelling. Human Development, 48, 115–135. Many years ago, when I walked into my first kindergarten class in an impoverished area of Philadelphia, my principal told to me to expect the best of my students but be prepared to be more than just their teacher. As a young teacher, I wasn’t sure I understood, but I soon came to learn that teaching children who live in poverty requires more than text books, shiny desks and a good daily lesson plan. I was thrilled to learn so much more from the Dr. Jensen’s video concerning how to teach and reach students who are poor. Just knowing that poverty changes the brain is so very important in our daily work as teachers. Children who experience acute and chronic stress have few coping skills, and this constant stress can lead to impaired cognition, lack of creativity and poor memory (Jensen, n.d.). The disconnected student as well as the hyperactive student may both be reacting to and experiencing stress, therefore, it is incumbent upon us as teachers to understand, react appropriately and remember the most important fact – the brain can change! Our role as teachers takes on a new meaning with children of poverty as was discussed in the video High Poverty – High Performing Schools (n.d) Our students must be in a risk-free environment, not only where they are safe, but where their thoughts and ideas are safe and valued. During this week’s lessons, we read and heard numerous times that relationships are most important to children in poverty. Knowing that there is one person you can count on, Dr. Jensen said, can make all the difference in life of a child who experiences uncertainty and high levels of stress. Dr. Jensen has challenged us to think about what we are doing, because much of it is not aligned to how the brain works. We need to change curriculum to engage students and help them thrive, enrich the environment in which we teach and assess students on what they know. I was thrilled that Dr. Jensen’s work was included in our learning. Although much of the data was disturbing, it is important for me to understand Dr. Jensen’s work. The brain can change and a teacher can make a difference. These are the messages I will take into my classroom each day. Born, C. (2011). Understanding poverty. PPT., Franciscan University of Steubenville,	Steubenville, Ohio. Can I erase the effects of their individual home life? No I cannot, but I sure can be an avenue promoting change and a different view point. I do not have to accept their lack of respect to me or towards another individual in the classroom because that is all they know at home. I have the power to reverse some of the negative social behaviors if handled appropriately. I do not have to accept the fact that no one ever encouraged them to complete a homework assignment because what’s the point of doing it; I will encourage them to do their work, because learning opens doors to the future for successful jobs and careers. I can better understand the students in my class because of Dr. Payne’s Framework book. I have to provide academic rigor plus curriculum relevance and the caring relationship to make academic gains. My students aren’t necessarily refusing to use the technology tools, they seriously might not know how to use them properly and just need someone patient enough to teach them. They might not be intentionally holding back on completing an assignment, they literally might have no idea how to begin the day or lesson. I have to be a support system and a role model for students and parents when they call or email and feel like they are at the end of the rope and have no hope. I need to set the tone; I need to help children realize their potential; I need to provide a classroom that is rock solid in dependability and emotionally stable. A great relationship with our students and families will help reduce stress and make everyone’s life easier. What touched me the most about Dr. Jensen’s video is the fact that he has connected brain based research with students of poverty. His acronym (EACH) describes and explains the variables that can affect a student of poverty. He starts by explaining the importance of emotional support and attunement and how with the lack of emotional support during the primary years can limit the range of emotional expressions and responses. He also states that the repercussions tend to show up in schools with students lacking the ability to trust. Next he discussed how Acute/Chronic Stress can be a significant stressor to learners in school. Poor children are more likely to be class wondering if they are going to have a dinner at the end of the day, rather than what’s for dinner. Dr. Jensen discussed how poor children are exposed to more stressors, longer lasting stressors and have fewer coping skills than their higher SES counterparts. He also stated that 42% of middle class students experienced stress most or all the time, but also lacks the coping skills. Cognitive Stimulation is also discussed in the video regarding ways to connect with the student not just on an academic level but a personal level. Increased allostatic loads impairs cognition, creativity and memory, social judgment skills are diminished .Differentiated instruction and teachers knowing as much as possible about their students and their families are keys for success. Next he looks at Health and Safety Issues, and how poverty issues takes on challenges, from medical to emotional. Some of the risk factors included disabilities, chronic illnesses, and delayed development. What makes this video so great is, he is teaching each of us to try to think outside the box. We have a motto at our school which is ”Know each child by name”. We also need to have as much parental Involvment opportunities for parents to participate in their students’ education. This week’s topic on poverty from a brain-based point of view was quite interesting. There were a lot of points that were brought up in Dr. Jensen’s video, How Does Poverty Change the Brain. I had never thought about how different teaching tactics would be perceived differently by different learners. For instance the little ‘scare tactics’ that are used-preparing for a test or springing a pop quiz on a student-are handled differently by students of poverty than other students. I also was unaware about how a student of poverty perceives life and what they value to be important (which isn’t school), their thoughts are about making it through today and not about making their future life better. This week’s learning reinforces the knowledge that knowing your students is one of the most important parts of being a teacher. By knowing about your students and what they are dealing with outside of the classroom will help you be able to reach and teach them better. Jensen, Dr. Eric. How Does Poverty Change the Brain. Video. Indeed, the challenges are complex. Dr. Jensen correctly describes a curriculum that often do not engage students, environments that sometimes do not enrich students, and methods of assessment that do not always accurately gauge what students know. We have an aging teaching force, many of whom were taught in undergraduate education programs that primarily stressed the traditional, didactic method of pedagogy. And as Dr. Jensen notes, significant numbers of children are being raised in poverty and have brains that are functionally affected by a lack of emotional support, prevalent acute and chronic stress, lack of cognitive stimulation, and environmental health and safety issues (2011). This is why the challenges are so complex. We have significant systemic and societal crises. As educators though, we must remember that we are obligated to teach all of the learners in our charge. With a general understanding of the neuroscience of learning, we can create engaging and nurturing learning environments for our students, where they feel safe and can focus on processing information. With the development of trusting relationships with the learners, we can challenge them to high levels of achievement. This expectation must be made of all of the learners in our classrooms, children of poverty and otherwise. Teaching students from poverty can be sad at times. I student taught in Akron city schools and I found myself forming close relationships with my students. I knew they did not have much at home, and I seemed to constantly bring treats and prizes into the classroom to give to my students, and I always wanted to give more. Since I was with the younger students, I felt a need to really work on building relationships because I was one of their first teachers and I was unsure of their relationships with their family members. As Jensen discusses, children being raised in poverty are less likely to receive the necessary care during their early developmental stages. Jensen references attunement, which is the process by which a primary caregiver, normally the mother, develops appropriate emotional responses in the child. He stated that humans only know 6 emotions at birth. Children develop other emotions during time spent with the caregiver. Quick back and forth games played between parents and children such as peekaboo, and hide and seek generate the new, different emotions. As an Early Kindergarten Elementary Teacher Facilitator, I see what the four year olds learn from their caregivers. I am able to hear them speak of their numbers, letters, shapes and colors through their assignments. I see their work submitted on their worksheets that are scanned in. It is very reassuring to know that these caregivers are dedicated to teach basic knowledge and skills to their four year olds. They understand how important this early development is for their children. When I thought about the challenges educating students from poverty, I had always thought about schools with low funding, poor teachers, little resources, etc. I never really thought about the brain based impacts as Jensen describes. It is very interesting, especially from an online teaching environment. Our school makes the claim that all students, regardless of socio-economic status, will receive the same education. Although this is true on paper, Jensen proves there is more to it than just providing consistent curriculum and delivery. My online school does keep the students anonymous. No one will know which students are poverty stricken. We provide computers and reimburse for internet access. So, educationally speaking, all students are equal. This eliminates much of the stereotyping based on myths and classism as Gorski documents in his publication titled The Myth of the Culture of Poverty. However, how do we address the issues of the students who are not provided adequate care, such as food and shelter? These students will still have several of the brain based disadvantages and different reactions than students from higher socio-economic statuses. This is definitely a challenge we need to address. Dr. Jensen says that 80% of the curriculum is the same curriculum we had 50 years ago. Teachers need to learn new ways to relate to students due to the changing times over the past 50 years with technology and real life experiences so they can pull the students in and want to learn. We have found that economic class does have to do with the way a student can learn, but also that a high quality teacher can change that. Jensen says that education should be developmentally appropriate and that it should pull the kids in to want to learn. It should be an enrichment environment, and the students should be assessed in ways that they are assessed in the real world. Poverty has a negative effect on students. Even though over 1/3 of students live in poverty, family interaction can help with the educational process. Parents of children that live in poverty do want to choose the best education for their children. I work with many children at the poverty level. Students that are cold and hungry. Students that live in an unsafe environment. Students that live in a high stress environment. It is my job to make the students feel safe and welcome in my class and to try to make them want to come to class. “Friere (1970) and Mead (1994) wrote of the obstacles for impoverished students who realize that education opens doors that lead to a better life than the conditions experienced by their parents and grandparents”. This was a very interesting topic. It’s always seemed logical that students from poverty would be affected by having more stressors, but I never realized the extent of it and how poverty affected their minds. Dr. Jensen’s video was insiteful and he had a lot of good ideas. Attunement seems like something that would come naturally. I guess I took for granted that not all children are taught those skills as infants and what kind of an effect that can have on them. Being in a cyber school setting, it’s harder to tell where our students are coming from. I think it’s also harder to read their emotions because you don’t have their facial cues to go by. You don’t always know in a public school setting either, but there are clues that you typically pick up on when you are face to face. In a couple of my school placements as an undergrad, there were high poverty rates…especially in the inner city schools. In both of those situations my cooperating teachers had a gift with those students. Like Dr. Jenson talked about forming good relationships to build trust and diffusing stress, these teachers could do that. They turned the classroom into a safe community and got those kids to open up. I try to be understanding of all of my students and their individual situations, because they all have something that they are dealing with. Dr. Jenson’s video helped me to get more perspective on students in poverty. I also thought it was interesting in the one video where the girl who was living in poverty explained how she should be taught. She said that students in poverty don’t think about the future, or even about tomorrow, they’re just trying to get by day to day. At the high school level, it seems that we focus a lot on creating goals for the future and encouraging students to work towards them. There’s nothing wrong with that, but with students in poverty who are struggling each day, I can see why it would be overwhelming and more stressful to discuss the future. They also had to grow up before their time. These videos opened my eyes to the fact that these students need to be approached in a little different manner and I will be more sensitive to that in the future. Teachers today face a daunting task in educating America’s youth. The challenges that students are presented with, both in school and out, their performance in the classroom. One factor that has an enormous effect on the way that students learn is their poverty level. In general, when one thinks of how a teacher prepares for their day they usually think of creating lessons, implementing teaching strategies, incorporating engaging activities, and fostering lively discussions. One does not usually think of how to adapt lessons so that they reach children who are in poverty. Yet this is something that all teaches should be prepared to undertake because the problem of poverty is pervasive throughout our society and reaching these children is crucial if we are to ever break this cycle. Dr. Eric Jensen, in his video, How Does Poverty Change the Brain, discusses the physiological effects of poverty on the brain. Two specific areas, among others, that he notes are how poverty effects the emotions of a child and how poverty effects the level of stress that a child feels. Children who grow up in poverty are much more likely to have emotional challenges. An interesting process that Dr. Jensen describes in the process of “downloading” that children experience when they are young. Downloading means that a child is not mature enough to process their experiences (whether positive or negative) so they simple take in, or download, everything that happens around them. In other words, they are not able to see the reason why something happened. They just know that it happened and those experiences help to shape the way that their brain is wired. Living in poverty, as you might have guessed, causes a lot of negative “downloading” to occur. Another side effect of poverty that Dr. Jensen describes is that of chronic stress. Children who are constantly exposed to the fear of living in a constant state of unpredictability and instability have an extreme amount of added stress in their lives. Poverty often effects more than just not being able to buy the things that you want. It has a negative effect on relationships, marriages, quality time that is spent with one’s family, and much more. Children are extremely intuitive and can pick up on this quickly. This kind of stress impairs brain cells and causes children to be at a disadvantage in the classroom. Teachers today must work to develop and implement appropriate strategies to teach children who are growing up in poverty. They must be equipped to reach these young minds so that the effects of poverty on a child can be reversed and so that true learning and growth can occur for each and every child in their classroom. The resources Dr. Payne refers to are financial, emotional, mental, spiritual, physical, support systems, relationships/role models, and knowledge of hidden rules. These resources affect student’s achievement because without them students lack the support and confidence they need to make educational decisions and feel confident about their abilities to learn. Dr. Jensen’s acronym EACH supports Dr. Payne’s statement about poverty being the extent to which the individual does without resources. He explains that students from poverty are not receiving the support they need from their caregivers. Dr. Jensen refers to attunement. Without attunement the student enters school with a narrow range of responses. The student will react to what the teachers does with a response and when the teacher does something else the student will react with the same response. He explains that attunement creates the range of emotional expressions. This is important in the early ages of learning because if the student is not taught how to respond they will not know how to do it. He also explains that attachment is important. Children need reliable caregivers. If there is not a reliable caregiver the child has no trust. As an Early Kindergarten teacher I see how attunement and attachment are extremely important. My students who come from families with reliable parents who teach them right and wrong as well as responsibilities often have higher achievement levels. These students are often more confident and eager to participate. They want to learn new things and want to be active in their own learning. The families are supportive of the student’s education and emphasize the importance to the students. n In return the students listens to what their caregiver is telling them and trust that what they are learning from them is important. I learned many interesting fact by watching Dr. Jensen’s video on how poverty changes the brain. I especially enjoyed the portion on attunement. While working in a traditional public school, I worked with many students who I now realize probably never had that back and forth banter with a caregiver. They had a very limited range of feelings and emotions. I also found this section interesting because I have a 12 month old son. I was happy when I realized that I am already doing many of the things Dr. Jensen mentioned. In the future, I will be certain to take things like poverty level into consideration when working with students. I know realize that there are many aspects of a child’s personality and emotional range that are affected by their povery level. Even if it was only for a brief time in their life, it can have long lasting effects. I will strive to do what I can to help my students from poverty succeed in school and in life. Poverty has a significance impact on a child’s education. As stated in Dr. Born’s PowerPoint presentation, 1 in 5 children in the United States are living in or near the poverty line. Poverty can be caused by employment of the parents and their yearly salary, the structure of the family, and the education of the parents. There is information stating that the involvement of the parents in their child’s education is very important. I am a firm believer that the more time the parents spend having an active role in their child’s schooling, the child is likely to have a better success rate. However, if a family is living in poverty, how much can parents be involved with their child’s education? If the parents have jobs that require shift work, not much time is spent focusing on the children’s studies. Many parents may need to work two jobs. This also takes away from the time spent making sure that the students are completing their work or understanding certain concepts. Family dynamics plus the lack of employment or high salary can also work against a student succeeding. If you have a single parent without a job or with multiple jobs, not much time can be spent on ensuring their child is doing well in school. Research regarding poverty and education is very important. I personally worked in a school for about a year where our student population was almost all living in some type of poverty. Many of the sources from our learning session this week mentioned observations that were familiar. One of the videos in the PowerPoint was an “interview” with a poverty-stricken youth. She mentioned that students living in poverty do not think of a future, they only think of the present. It was also mentioned in the research article regarding learning design. I witnessed that day in and day out for about a year at my old school. I personally feel that is one of the most difficult obstacles to overcome, because education is a door to the future and generally not designed for instant gratification. The most common question I would be asked by my students was “why do I need to learn this?”. That can be a difficult question to answer when it comes from that population of students. And as much as a teacher would like to assume that these students should be able to learn just as a middle-class or upper-class student, that is not the case. As the video form this week explains, the brain can actually change from the stress of living in poverty. Stress can affect the neurons in the brain. As Jensen explains in the video, when the brain is exposed to chronic stressors, it goes into survival mode and limits the capabilities of the brain to conserve. Poverty-stricken students are constantly in survival mode, wondering where their next meal is coming from or where they may sleep that night. These things that most students take for granted are constant question marks in the world of poverty. At least since the 1960s, when President Johnson famously declared war on it, poverty has been a very sensitive and difficult subject for Americans. The more resources we seem to throw at it, the more intractable poverty appears to become. For this reason, a productive dialogue concerning how poverty impacts education can quickly become co-opted by political and philosophical (and economic) arguments. Yet, when you get beneath surface squabbles, I believe most reasonable people will find themselves in agreement on many important points. For example, I like what RiShawn Biddle, in his “Dropout Nation” podcasts has to say about creating a culture of high expectations and excellence in order to transcend what he calls the “pedagogy of poverty” that results in educational mediocrity in general, and low expectations and failure in particular for students from economically poor backgrounds. Understanding the difference a good teacher can make in the life of a child, Biddle cautions us not to let ourselves off the hook by blaming poverty for the educational challenges that face us. Yet Jensen, who would agree with Biddle on the impact great teaching can have on students regardless of socio-economic background, has also demonstrated the real, physiological impact poverty has on the development of children. Simply put, children growing up in economically circumstances are deprived of the very culture of high expectations and excellence that Biddle says is so important. Anyone who has followed recent discoveries about neuroplasticity and the brain’s ability to change and even heal itself will know how important it is to keep the brain challenged, fed, and inspired by rich, relevant, and multi-sensory experiences. Poverty denies people, and especially children, of such experiences. Children in the throes of anxiety have little resources left to focus on learning. Biddle himself acknowledges this when he says we should be working to provide poor children with opportunities to engage in a variety of stimulating experiences, and to create within our schools a “culture of genius.” I believe Jensen is calling for the same thing when he advocates for creating authentic community in our classrooms, which includes nurturing relationships. We need to model that culture of genius and those nurturing relationships at all levels, beginning with a more humble, open, and authentic dialogue concerning the impact of poverty on education (and beyond) and how best to respond to it. Let’s draw in the best of cultural resources for the benefit of educating the next generation of Americans, and let’s draw upon the best of what each of us has to offer on an interpersonal level to create that culture of genius, and the community of excellence. The video “How does Poverty Change the Brain” by Eric Jensen was fascinating to me. Since learning about brain-based research in relation to education, I have been very interested in the subject. The idea that poverty affects the brain is an area I would like to explore more. In the video, Jensen talks about an acronym called EACH. It stands for emotional support, acute/chronic stress, cognitive stimulation and health and safety issues. Under the emotional support he talks extensively about the contrasting experiences between low income and middle class children. The area I found most interesting was attunement. This is the process when a caregiver develops appropriate emotional responses in the child. I didn’t realize how something as simple as playing peek-a-boo with a child could have such a positive affect on the emotional support of a child. I often wondered why some of the students I work with are so withdrawn and others are friendly and well adjusted. As I go forward, I will look more closely at the socio-economic background of my students. One of the points I found that I feel relates to my work experiences is to not tell my students just what to do but, to teach them how to do it and how it is going affect their everyday life. As an educator I can’t help them before their school years but I can use the research to help them once they reach school age. Social economic status does affect a child’s ability to learn. I found “EACH” interesting in that it shows how students develop skills from infancy to school age, all of which will affect their lifelong learning. In reviewing the 10 tips for using brain-based teaching and learning, I found number five ”differentiation” to be the most fitting for our cyber school. Our self paced courses allow students in the same course to be at different levels, pages, and chapters. Our curriculum has outlined the set skills and concepts, we provide them with the information, texts, and assessments, and in the end we hope the “run with it” and have successfully learned that information. We allow our students to show case their learning differences by allowing them to work at a fast pace if they are gifted or “average” in school, or to work at a slower pace if they need a little extra support or help with the content. Although it may not have our intention to use the brain based learning with our students in our classes, we are doing it and many students are having success with it. Working with children who live in poverty can prove to be a difficult challenge for many teachers. Children who grow up in poverty tend to be in an environment that is less enriching to them and do not promote proper brain development. One question that Jenson (2010) asks of why some students do well and some do not brings into focus just how much poverty can affect student learning. Dr. Jensen’s examples of curriculum, being the same format that has been used for the past fifty years and environments not being enriching enough for students show that poverty can affect these areas in a negative way (Jenson, 2010). The most interesting area that Dr. Jensen discusses is that of assessment testing. I have noticed that most assessment testing is done in a manner that most students do not use outside of the classroom and that assessment testing does not test on what children know in real world applications. Dr. Jensen even states that brains physically change when students are living in poverty (Jensen, 2011). The areas of emotional support, acute/chronic stress, cognitive stimulation, and health and safety issues are key factors that students need enrichment in, for their brains to develop properly (Jensen, 2011). His idea of “attunement” being the back-and-forth responses that develop between a young child and their primary care giver showed me that even early on, the interaction between people is critical in developing a range of emotional responses that are necessary for early development (Jensen, 2011). I also like how he stated “don’t teach kids from poverty what to do, teach them how to do it and teach them the skills for it” (Jensen, 2011). I think that this shows that children from poverty sometimes do not have the skills to understand how to act in a classroom and cannot understand why it is important to act this way. Learning emotional responses such as these can be time-consuming and if they have never had someone use these techniques on them, then there is no way for them to learn from these techniques (Jensen, 2011). This can make teaching students who are living in poverty difficult, due to the fact that they do not have this type of learning support at home which can lead to problems inside the classroom such as disruptive behavior and a lack of trust between the teacher and the student. Dr. Jensen describes enriching home environments when talking about helping impoverished students. Paul Gorski adds that “In fact, the severe shortage of living-wage jobs means that many poor adults must work two, three, or four jobs.” So, time that could be spent reading or working on educational activities in the home, are being spent at work. I believe that the time parents spend with their children doing such activities has a great impact on their child’s future education. A child whose parents work diligently with them on their education has a better chance of success than a child whose parents are working all the time. This is nobody’s fault, it is just a sad fact of life. We as educators need to see what is happening in the homes of these impoverished students and take actions to help them succeed. 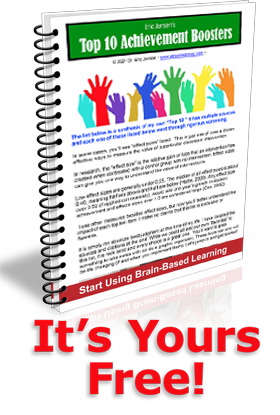 Brain based learning is a theory based on structure and function of the brain. According to the theory, learning occurs as long as the brain is not prevented from normal processing. The human brain can be described as an incredible processor making every human capable of learning. The issue is whether or not traditional schooling inhibits learning when students are discouraged and/or ignored. Dr. Jensen’s discusses the effects that poverty has on the brain. Two potential barriers of learning due to poverty include emotions of students and the level of stress on students. As a result of poverty, varied emotions, and high stress levels; students download their experiences differently. Dr. Jensen suggested that downloading in children living in poverty is highly negative. Poverty is always going to be a part of life. It is unfortunately something that should not exist in a country that is said to be as powerful as the United States but it does. Education and specifically teachers do not choose their students they have from year to year but they must adapt to them. Regardless of social class, teachers must find ways to reach out to students who come from lower class families. Their experience within the eight plus hours in a school needs to be one that is positive and calming. A teacher can control the time a student is in their classroom, they must take advantage of this situation to benefit each student. There were several statements in Jensen’s video, “How Does Poverty Change the Brain?” that really caught my attention. One statement was, “Don’t tell kids from poverty what to do – tell them how to do it.” This statement concurs with Dr. Born’s PowerPoint that each socioeconomic class has hidden rules in which individuals live. Children who come from poverty focus on survival skills. Their parents need a job that will pay the bills, not necessarily something they plan to make a career out of, and the quantity of food in the cabinets is more important than the quality (Born, 2011). Since parents may have to work longer hours and have less flexible work schedules, parents may miss out on school functions and demonstrate less attunement than parents in the middle class. Parents of students who live in poverty are less likely to teach their children appropriate social skills and work on academics at home (Gorski, 2008). For this reason, I agree with Jensen that teaching kids skills and telling them HOW to do things is much more efficient than simply telling them WHAT to do because not all students receive the same support and instruction at home. Along the same lines, I also agreed with Jensen’s statement that it is the “quantity of quality time that counts.” Showing children love and attention will allow them to “download” positives rather than negatives. There are a number of students who come from low socioeconomic families at PA Cyber. While it is more difficult to demonstrate attunement in the virtual setting, it is essential that teachers model positive social, emotional and academic skills. Due to the fact that many students who come from poverty lack a reliable caregiver, it is essential that virtual teachers send the message that they care about the students and will be there for them if the students need anything. One positive role model (including a teacher) can make a huge difference in a child’s life. Gorski, P. (2008). The myth of culture and poverty. Poverty and Learning, 65(7), pg. 32-36. Dr. Jensen makes many interesting points about the challenges we face, as educators, when trying to help children overcome the disadvantages of poverty and receive a quality education. Dr. Jensen points out that poverty affects the brain and therefore changes the way that children who live in poverty think and learn. If 80% of our curriculum is the same as it was 50 years ago it cannot possibly relate to the children of today. I agree that we need to use curriculum that today’s students can relate to. (Jensen). As a teacher and an Instructional Supervisor at a cyber charter school I work with many families who live in poverty and want a safe learning environment as well as a quality curriculum and education for their children. These families make sacrifices to see that their child succeed despite the odds. We owe it to them to do our part to work as a team and provide the curriculum, technology and support they need. By using cutting edge technology that children are already interested in (such as laptops and iPads) and combining it with courses that students are interested in we are taking a step towards making students want to learn. Many of these families who are struggling from poverty can not afford internet, let alone iPads and laptops. Only 69% of children from low-income families graduate from high school let alone furthuring their education by attending a college or trade school (http://www.spotlightonpoverty.org/education_and_poverty.aspx). We now know that there is research showing how we can help students living in poverty succeed and overcome the obstacles. It is up to us as parents and educators to use the research and the options available to help these children overcome these obstacles. After watching Dr. Jensen’s video about how poverty affects the brain I began reflecting on my previous experience working with learning support students in an affluent school district. There were a disproportionate number of lower income students in special education. In fact, it seemed that nearly all of the learning support students came from one of two small neighborhoods in the district. I had the privilege of working with these same students from elementary to middle school, and I could see evidence of what Dr. Jensen speaks about. One had to work very hard to build relationships with these students. There were a few students whose only reaction to anything surprising or uncomfortable was anger. They may not have had the opportunity for interaction with a stable care giver when they were young. I can also see Paul Gorski’s point in “The Myth of the Culture of Poverty” where we have to be careful not to assume that all students who grow up in poverty are the same. As educators we have to work to meet the needs of our students. Part of this is understanding where they have come from and doing our best to reach them. Eric Jensen’s theory on how children that live in poverty suffer a huge disadvantage in their learning abilities is a very interesting topic. Children that live in poverty come to school with a huge disadvantage and don’t know it. If you are a teacher in a district that has a high percentage of students that live in poverty you have to be aware of this and tie in teaching strategies that will give these students a better chance at success. As a Title 1 school we at PA Cyber need to be aware of these disadvantages that some students will bring to the classroom. The social issues that students might have when live in poverty may not apply to our classrooms the same as they would in a brick and mortar school but the learning techniques or lack of the positive learning techniques might be something that we should focus more on in the younger grades. We are definitely changing the way that curriculum is being delivered to students. We strive to keep our technology in the higher end of the cutting edge technologies. We need to also see what teaching skills we can introduce into our virtual classrooms that will give all students the appropriate advantages to succeed. Being a school of choice hopefully takes away some of the stress that students might feel when being introduced into a new environment. When we interview students wishing to attend our school we stress to them that the student must want to be enrolled in our school for this option to be successful. Our chance of reducing stressors in the student’s life is limited in our learning environment but one of the possible advantages would be that the student may feel some sort of anonymity and may open up more. I am sure that the verdict is still out as to whether our online teaching environment might be able to have a positive influence on children that live in poverty. We must keep on trying to make a difference in every student’s life. Dr. Born, cited a figure in his Powerpoint presentation that one in five American children are living on or near the poverty line. Combined with Dr. Jensen’s clear description of the far-reaching affect that an impoverished environment has on the developing child, it has been clearly illustrated that the effective teacher will need to be constantly vigilant, understanding, and fluent in the language of compassion when providing for the unique needs of impoverished students. Given the current economic climate and forecast, this aspect of the educational process is almost certain to become even more demanding, requiring teachers to constantly reevaluate their individual methodologies and perspectives. Apart from the sheer volume of students, for whom silence and/or camouflage are often a common self-defense tactic, one may also deduce that the quickly changing realities of the current economy will likely result in a rapid growth in the number of children requiring an adjustment in educational delivery. As an Instructional Supervisor with the Pennsylvania Cyber Charter School, my position affords me a greater view of my student’senss respective backgrounds than that of the more traditional brick and mortar teacher. This information, combined with regular contact with both the student(s) and their parents provides me with an opportunity to develop and nurture the very kind of relationships that Dr. Jensen advocated in his video presentation. The very nature of cyber education, because it is perceived by many to be a radical departure from the “tried and tested” traditional educational model, is based on a greater degree of trust than a brick and mortar school. This could be viewed as an advantage by those who would adopt Dr. Jensen’s techniques, provided of course, that the trust is reciprocated and maintained. One aspect of Dr. Born’s Powerpoint that was particularly striking was the student-produced video depicting a “interview” with a student who was voicing the unique needs of the impoverished student. The student stated that she rarely looked to the future, but preferred to focus on the “here and now.” But at the same time, it was plainly evident that the poverty-driven environment is far from stable and, as a result, the unique needs of an individual student my quickly change from one day to the next. Vigilance must therefore be adaptable to the changing situation, and the educational strategies employed with such students must be fluid and adapted to meet the changing needs. The fact that socioeconomic status effects the brain in a multitude of ways is a clear indication that we as educators need to rethink and reinvent our curriculum in terms of delivery and content. I found it interesting that the content really has not changed in many years, but not surprised. Today’s student is much different than those of previous generations and needs to be cared for in new ways. We now realize that one out of every five students live in poverty, which has a profound impact upon their learning. While reviewing the information provided in our learning session, I tried to think of students whom are in this category and the impact that it has on their success. In our online setting, it is very difficult to gauge whether or not our students are suffering from a difficult and unpredictable home life and if they are, how that stress negatively impacts their brain. The thought that these students do not focus on their future, but only day to day living is very disturbing to me. It is no wonder that these students living in impoverished conditions are stressed beyond belief and basically shut down. I feel that the biggest idea suggested by Dr. Jensen is that of creating an enrichment environment for students to feel secure and confident within. Many students are not taught the proper emotions or reactions at an early age. They do not have the capability to react in a widely accepted manner because they have not been shown these reactions. Dr. Jensen referred to these as Attunements, and stressed the importance of spending great quantities of time working on this type of learning. It was also stressed that the quality of these interaction is of the utmost importance. I feel this why it is important for educators to understand this and provide a productive learning environment. In the video Dr. Jensen referred to building the enrichment environment as “building an emotional house” for the students to learn in. Teachers have their work cut out for them with some students who are not provided this emotional support at home early in their development. They have to build trust and a positive relationship in order to begin to reach these children. I think this video is a great reminder that students face all sorts of issues in their day to day life and teachers should be more understanding and supportive to have the best outcomes. I learned a great deal of knowledge from Dr. Jensen’s video, How Does Poverty Change the Brain?. I have heard many statistics before about factors effecting education in children in poverty. One piece of information I have heard multiple places is the limited vocabulary children of poverty have in contrast to children of more affluent families. Even with learning such pieces of information such as that, I have never really explored the other ways in which children of poverty are delayed. According to Dr. Jensen, emotional support, acute/chronic stress, cognitive stimulation, and health/safety issues are all troubling issues facing children of poverty. Dr. Jensen went on to present ideas or concepts that caregivers of poverty are less likely to provide. Most striking to me was attunement. I was enlightened when I learned about attunement as I was new to this term. I found it fascinating how influential the actions of the caregiver are, even of actions which may appear to be minute on the surface. As Dr. Jensen was discussing actions as they relate to attunement, I couldn’t help to think of my sister and her one year old daughter. My sister is so animated with my niece and plays simple games with her as well as making faces, imitating gestures, giving positive responses, etc. I am almost positive my sister has no real idea of attunement, so this is most likely just innate to her. I say this because I have found myself doing similar actions to my niece as well as other young children I have been around. It’s humbling to find that not all mother’s or caregivers do this with their children. I also started to think about the children I have come across in my career working with children that lack of attunement during the ages of zero to five can likely be the cause of some behaviors within the classroom. Dr. Jensen explained that without attunement, children have a narrower range of behavior simply because they do not know how to express themselves emotionally to others. My question regarding this is if it is possible to teach these students how to properly express themselves despite being past their ‘prime’ to learn these emotions that we are not hardwired to have. Another thing I took away from the video was how students need a stable and reliable person. Instability opens the door to stressors in their lives. Teaching in a cyber schools poses a great challenge to reach these children of poverty to provide them with the stability they need and reliability. How do the teachers in an online learning environment become that teacher who makes a difference when they only meet with a child via the internet and for short periods of time throughout the week? Even in a brick and mortar school, it takes a special type of teacher to be that ‘influential teacher’. I think it is quite possible for a cyber school teacher to be influential, but I would imagine they would have to be one step above to be able to reach a child they are teaching over the internet due to all of the barriers through this mode of instruction. I’m not saying it can’t be done, but it takes extra care and effort from the teacher in a cyber education world. Dr. Jensen’s work is captivating and relates to every teacher since some form of poverty is present in virtually every school in the US whether it be absolute poverty, situational poverty, generational poverty, or relative poverty. I am interested in learning more about this fascinating topic to better prepare myself as a teacher to address the needs of these individuals. With socioeconomic status having such a large impact on student success educators needs to look at the curriculum being used and how it’s delivered. Using curriculum that is 50 years old is not meeting the needs or relevant to the students. Students need a curriculum that grabs their attention so they want to learn. Over 20% of students live in poverty. This is a large number of children in schools who need a change to help increase their chances of being successful. As a teacher in a cyber setting, it takes me longer to identify these students not seeing them face-to-face. After communicating with the parents and students over a period of time, I am sometimes able to learn about their situation and environment. Being able to identify these students in a more timely manner would be beneficial. I do believe that the cyber setting helps individualize the curriculum to the student. I also feel that the relationship that is built between the parent, student and IS is what Dr. Jensen is referring to. While viewing the video, How Does Poverty Change the Brain, I had so many aha moments! I understand so much more about the effects of poverty on the brain than I ever have before. I never really considered that the brain actually changes physically because of poverty. In looking at the emotional differences of children of poverty, I was really struck by the idea of attunement. I recognize that the back and forth between a mother and child or a stable caregiver and a child is crucial in a child’s development. That idea of teaching children the appropriate emotional response to me is one that I thought came natural to everyone. I think I took for granted that not everyone is taught that. I also agree with Dr. Jensen when he talks about the quality and quantity of time spent with children. People now think that a small amount of quality time is ok. As he stated, it is the quantity of the quality of time that counts! I also was effected by the idea of “downloading”. How important is it to understand how a child sees the world? VERY – they see their parents fighting and fear is downloaded! I was so inspired by this video and really have opened my mind and eyes to how poverty affects the brain in so many ways! Thank you. However, what factors help students living in poverty succeed? I like the fact that Dr. Jensen points out ways that we can improve student achievement with these children instead of just telling us why students living in poverty do not succeed. For example he points out those children who come from poverty need a nurturing and safe environment for learning. As a teacher at a cyber charter school I have many parents that choose our school because they feel the home school districts that they live in do not offer a safe learning environment. Teachers and administrators need to realize that in order for student achievement and test scores to go up a student has to feel safe when going to school. Students living in poverty need to have a curriculum that caters to their needs and the way they think. If research proves students who are living in poverty learn better any certain way we need to cater to these needs as educators. It is our job to educate the children, not their job to conform to our way of education. If 80% of the curriculum we use today is the same as 50 years ago we should start there. Create curriculum that fits our students needs and we will see students start to perform better. Teach them things that they are interested in and teach them in ways that they understand. This is how children will succeed in school and overcome poverty as adults (Jensen). Dr. Eric Jensen presents a very interesting true view of how poverty affects the brain. I work in a school with a 42% of the students being placed in the poverty range. I can easily relate to Dr. Jensen’s information on how the stressors of poverty can affect a childs learning. As an adult, I have trouble concentrating when I have been put under stress, so I can’t imagine how much more difficult it would be for a child to concentrate and learn while under constant stress. Dr. Jensen made a lot of since when he discussed how important early relationships are to the developing child and brain. This correlation shows what a disadvantage a child from poverty come to the classroom in. Children from poverty have been continually traumatized for a variety of reasons and so have their brains. This causes tremendous challenges for the children and the teachers that must teach them. Dr. Jensen’s research and information on brain-based learning is incredible and totally applicable in my workplace. My school has a significant amount of students that come from low socio-economic standing. Even with all of the programs in place to aid these children in their education, it is the teacher’s responsibility to become knowledgeable on this topic. Dr. Jensen’s work has made me see just how important it is to handle these students specially in order to positively contribute to their educational needs. I hope to be able to maximize the learning potential in all of my students and have benefited greatly from viewing Dr. Jensen’s work. Dr. Eric Jensen’s research and information was eye-opening for me as I teach 3 year olds. Our curriculum is based in play and equipping them with the necessary social skills for elementary school. I saw the truth in the importance of emotional support of students, along with teaching students how to do what is asked of them instead of merely telling them what is expected. A teacher must make sure that they make and maintain a strong connection with students modeling expectations: it may be apologizing, or working through a problem, etc. Creating an emotionally sound environment is crucial for all grades and with parents as when students are able to relax in safe and supportive environments learning and success will increase, which should be our goal as educators; aide in students rising to potential. When reviewing the material from Dr.Jensen I saw so many of mys students. I have a better understanding of the needs of students who are embracing poverty. I agreed with one of Dr.Jensen’s ideas on telling students “how to do something” rather than “what to do” when working with children of poverty. This brings to mind one of my students who is constantly begging for my attention, she comes from a family of 16 siblings. She desires to learn but is over come with living in the moment and a need for step by step direction. My goal for her this year is to become more self confident and I work with her daily on this.